As a tech company located in the heart of Kitchener-Waterloo, Perk.com Canada takes our relationship with our community seriously. After a successful fundraiser for StuffIn Stockings during the holiday season, we set our sights on our next community initiative. 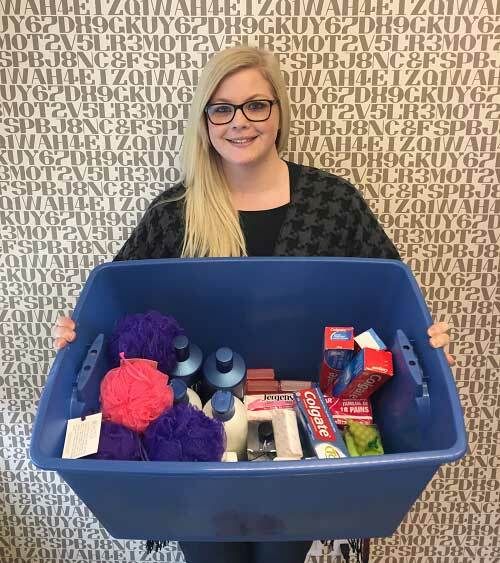 We pride ourselves on being an equal opportunity employer and supporter of #WomenInTech, so in honor of International Women’s Day on March 8, 2018, we arranged a donation drive for the month of March to support Women’s Crisis Services of Waterloo Region and Anselma House. Lyndsay was the first employee to bring in donations! International Women’s Day celebrates the social, economic, cultural, and political achievements of women, and symbolizes a call to action for accelerating gender parity. This year, the theme for International Women’s Day was #PressforProgress. With global activism for women’s equality and ending violence against women fueled by movements like #MeToo, #TimesUp and more, the call to motivate and unite friends, colleagues and our wider communities is being heard loud and clear. At Perk, we are proud to stand with women in our community as they start new chapters at Anselma House. Anselma House is a 45 bed shelter that serves women and their children who are fleeing abusive homes throughout Waterloo Region. In addition to providing a safe haven for women and children up to the age of 18, Anselma House also helps equip women and children with the necessary skills and tools they need to start over. This support ranges from education about violence against women to advocacy programs that connect residents with legal support, housing, parenting guidance, and transitioning towards independence. After reviewing the Anselma House Wish List, it is apparent that basic necessities such as feminine hygiene products, shampoo, and diapers are in high demand. Other items on the Wish List include gift cards for grocery stores, restaurants, and Chapters, and movie passes for family outings. In the 2016-2017 fiscal year, Anselma House served 169 women, 134 children, and received 2,467 crisis calls from families across Waterloo Region. We feel fortunate to be able to support such a worthy organization in our community, and look forward to delivering our donations to Anselma House at the end of the month. For more information on Women’s Crisis Services of Waterloo Region, and how you can get involved, visit their website. Alyssa is the Associate Product Manager of NewLifeOutlook. Her goal is to create a supportive, resourceful, and safe place for fellow condition sufferers to come together and exchange questions and advice. In her free time, you can find Alyssa hoarding beauty products, drooling over aesthetically-pleasing photos, horseback riding, marathoning episodes on Netflix, and blogging at her style and beauty blog, The Wolf and the Wardrobe.